There are 3 group rooms for the children to choose from. Each room has its special area. wooden building blocks “Duplo” “Lego” and natural building materials. Train sets and roads for cars and a garage are also there for the children to enjoy. This encourages creativity through craft activities, painting and drawing as well as through play with play dough, and sand. Fine motor skills are refined through cutting and pasting activities. This room offers many different table toys from puzzles, to magnets, to board games as well as dexterity games such as threading beads. In all of the rooms there are many books for the children to enjoy or to have read to. The children play role games here. It consists of dolls and other cuddly toys, a table with a little couch and a little room under the stairs, as well as a shop. There are lots of dressing up clothes, which further support their fantasy games. Here, the equipment is set up differently everyday. 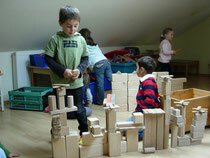 The children are encouraged to discover their physical boundaries through movement, jumping, balancing and climbing. There is the opportunity for more physical activity using a variety of sports equipment such as mats, ladders, slides, hoops, tunnels, benches, balancing equipment. ‘The Blueberries’ and the ‘The Strawberries’ for the Juniors and ‘The Seniors’ rooms the take on the role of ‘Home Rooms’. The gym is used for circle time for the all the children and carers. The kitchen downstairs becomes the focus for culinary delights. Weather permitting we enjoy the beautiful garden with its own little forest to finish the morning programme.